December 03, 2012 - Vienna – Tammy Erickson, founder and CEO of Tammy Erickson Associates, joined a global roster of speakers and participants at the two-day 4th Vienna Global Drucker Forum, where she presented her views on “Rethinking: Ten Assumptions that are No Longer True But Still Shape Today’s Organizations.” Executives, scholars and students attended the forum “Capitalism 2.0: New Horizons for Managers,” to learn about ways to maximizing shareholder value and consider what a new form of capitalism might look like. Tammy Erickson with colleagues at the recent Global Peter Drucker Forum, Nov. 15-16 in Vienna. 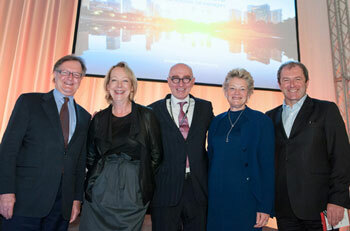 Left to Right: John A. Quelch (CN) distinguished professor of International Management, Vice President and Dean, China Europe International Business School and author; Lynda Gratton (UK) Professor of Management Practice, London Business School, Founder of the Hot Spots Movement and Author; Richard Straub (AT), President Peter Drucker Society Europe; Erickson; Session Chair Laurent Choain (FR) CHRO Mazers. According to forum organizers the 2012 Drucker Forum dealt with questions about the future of capitalism: How can the weaknesses of the system be repaired without crushing the innovative energies of free enterprise and competitive markets? And what is the role of managers in this transformation?